Samantha's royal lambskin dress with fringed belt was designed by Malinda Crews. Photo by Sherry Smith. Carly's fringed jacket is Danton's new "Duet" leather in turquoise, designed by Malinda Crews. Photo by Sherry Smith. Ashley's wearing a suit made of azure lambskin by Red Dirt Leather Works. Photo by Sherry Smith Photography. Ivy's navy pearlized lambskin suit is paired with a white lambskin shell. Designed by by Red Dirt Leather Works. Photo by Sherry Smith Photography. Danielle's jacket is turquoise lambskin with bronze lamb buckstitching. Designed by by Red Dirt Leather Works. Photo by Sherry Smith Photography. Kiana's rose lambskin suit is by Kristi Q Designs. Photo by Sherry Smith. 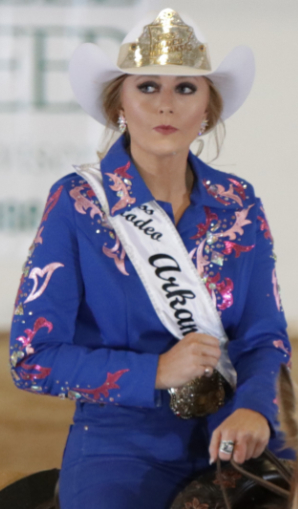 Bayleigh Warren, Miss Rodeo Arkansaswears a jacket with metallic leather collar designed by Sherry Smith. Photo by Sherry Smith Photography. Bayleigh's shirt has metallic leather appliques. designed by Brooke Lange. Photo by Sherry Smith Photography. Carly's beaded fringe dress is cobalt blue lambskin, designed by Malinda Crews. Photo by Sherry Smith. Taylor's red lambskin fringed dress was designed by Jan Faulkner Leather Designs. Photo by Sherry Smith Photography. All MRA photos by Sherry Smith. Leather rodeo queen apparel is featured for the sole purpose of providing visual inspiration for our clients, and is not sold by D'Anton Leather. However, the styles featured are all made with genuine D'Anton Leather. ©2017 D'Anton Leather Co. All Rights Reserved.